Are you having a hard time coming up with the money you need for college? You may want to consider one of the Top Financial Aid Schools of 2017. These institutions can help cover some or even all of the cost of your tuition due to special programs, grants, and incentives. And when you consider that the cost of higher education has climbed consistently over the past 30 years with college tuition rates increasing around 6 percent more than average inflation costs each year, it’s a no-brainer to give a top financial aid school a shot. While student loans are always an option, the debt they can incur can add up quickly and haunt you for years after graduation. That is why it is a good idea to consider applying to colleges or universities that offer the most financial aid to their students. Some of the schools on The Princeton Review’s annual list of the top 20 financial aid schools list may surprise you since they have the highest price tags compared to most other universities. This year, Vassar University is number one on the list with Princeton University placing second and Bowdoin College in third. Before deciding which college you will ultimately attend, you should take the time to consider everything a school has to offer, especially financial aid. It is possible to afford to attend a high-cost school as long as you qualify for scholarships, grants, or other types of federal aid. Once you have explored all of the financial aid packages available at different schools, you may end with options you initially may not have considered because of their high tuition price tags. In addition, students who focus on their studies, without being weighed down with the strain of incurring student loan debt, will have a less stressful undergraduate experience and an even better postgraduate financial situation. 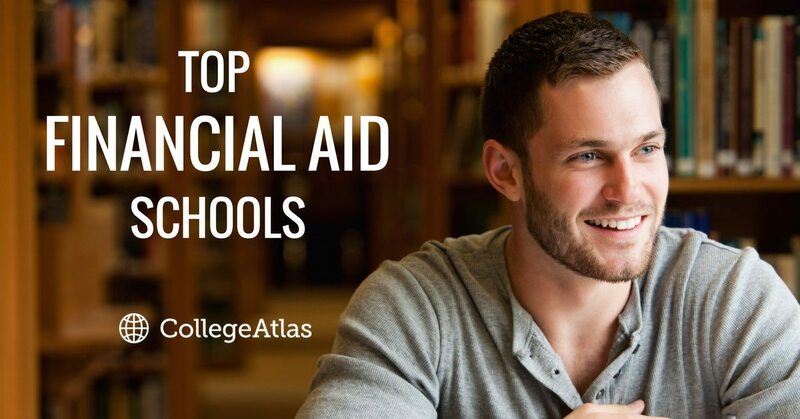 Curious which schools have the best financial aid packages? Here is the Princeton Review’s current list of the Top 20 Financial Aid Schools. *The Princeton Review is not affiliated with Princeton University or CollegeAtlas.org.